No Bake Milo Cake – There are just those moments that we suddenly crave for sweets at home, most especially if you have little ones, this might happen quite often. But of course, it would be nice to have a dessert that isn’t just some random chocolate bar in a convenience store. 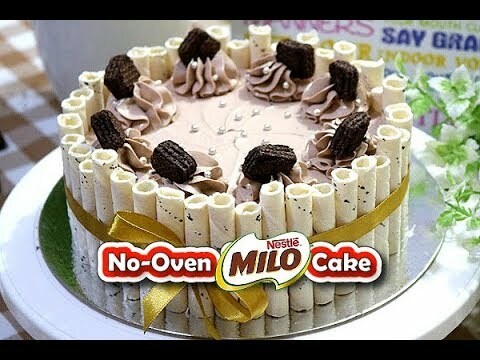 An easy dessert you can make with less ingredients and steps to make, is the simple but scrumptious No Bake Milo Cake. We all know how good Milo is on it owns so just imagine having a cake with having Milo as its main ingredient. The flavors that will come through in that soft sponge will be flavors anyone of any age will enjoy. What also makes this dessert a lot of joy to do is that it only takes a short time to do so and its limited ingredients aren’t that expensive as well. Preheat Stove-Top heavy-bottom Casserole or any similar cooking ware over medium heat for about 5 minutes. If using a heavy bottom casserole, put just enough salt to cover the entire bottom to avoid browning the pan and helps stabilize the heat evenly. Place fitted wire rack in the center and cover with a lid. The lid hole should be sealed with a foil so the heat can’t escape. Line 2 (7-inch) round pans with parchment paper. Mix all ingredients until smooth, at least 25 strokes or less, do not over mix according to package direction. Divide the batter into 2 pans and spread evenly. Cook the cake in a preheated casserole for about 8-10 minutes. Keep an eye of your cake coz’ we may have different kinds of stove and the heat varies. To check, insert wooden stick in the center and if comes out clean or a few moist crumbs, its done. Repeat process for the second batch. Fire off and let it cool completely on a wire rack, before frosting. I’m using 100g of Frosty Whip Cream Powder that would be ¾cups FWCP and to that we are going to add 1 pack (22g) MILO Powder and 1/3 cup of super cold water. Moistened the cream powder first before whipping. When it’s fully whipped and aerated, you can add vanilla extract if you want (optional) and mix until well combined. Transfer in a piping bag with your favorite nozzle tip and we are ready to frost. You need an 8-inch cake board or a serving plate. Place the first layer in the center and spread 1/3 part of whipped cream evenly, spread evenly. Top with the 2nd layer and frost the top and sides of your cake, reserved whipped cream for swirl later on. Cover the sides with halves Superstix or Stick-O and arrange them neatly, to secure the wafer sticks, tie it with a ribbon. Pipe swirls on the top edge of your cake and decorate with Nissin Cubee Wafer and Sprinkles. Chill for at least an hour before serving for easy cutting. Serve and Enjoy! This No Bake Milo Cake Recipe is easy to make and the ingredients are very cheap, you would really love this dessert because it is very moist and awesomely delicious.